Flipkart Vs Amazon : Future prospects in India | Business Article | MBA Skool-Study.Learn.Share. Binny Bansal & Sachin Bansal, Founders, Flipkart. The e-commerce industry is a sunrise sector in the Indian market at present. This can be primarily attributed to the significant reduction in the price of personal computers, the increased internet penetration in India, & the many incentive schemes (i.e. COD, varied payment options, discounts) that online retailers give to consumers. India has close to 10 million online shoppers , which is growing with a whooping CAGR of around 30%.In addition, India has one of the youngest online demographic audiences globally, with 75% of them in the aged group of 15-34 years. Apparel has been the fastest growing sub-category in online retailing, followed by consumer goods & sports & outdoor merchandises. A report recently published by the Boston Consulting Group also says that online retail in India could be a $84- billion industry by 2016 — more than 10 times its worth in 2010 . 3000 sellers on its platform and delivering 5 million shipments per month. It made its presence felt in online retailing by offering path breaking services like Cash On Delivery (COD), 30 Day replacement Guarantee, EMI options, Flipkart mobile app, etc. Amazon, the world’s largest online retailer entered India in 2013, & soon became a huge success, with their sales growing exponentially. As direct FDI is still not permitted in India, Amazon started by bringing together different online vendors on a single platform. It soon came up with innovative service features like ‘100% Purchase Protection’ on shopping, ‘guaranteed one-day delivery’, ‘next day delivery’ , ‘free shipping’ & ‘happy hours’. Amazon now sells 15 million products across 20 product categories. Like Flipkart, it too has launched its Amazon app & COD schemes. With the entry of Amazon in the Indian market, Flipkart needs to renovate & expand its business in order to sustain or increase its present market share. 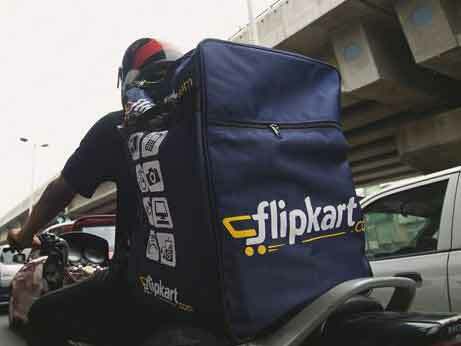 Flipkart’s plans for the future mainly include scaling up the size of its business. It plans to have 10-12000 sellers on its platform within the next few years. Also, on acquisition of Myntra, Flipkart presently owns about 50% of the organized lifestyle market in India. It plans to increase this figure to 70%. It has more than 1000 sellers now, & it wants to scale up this number to 10,000 to 15,000 in a year’s time, & to a few lakhs in 4 to 5 years. Around 40% of Flipkart’s online traffic now comes from mobiles. It thus wants to add more features to its mobile shopping app, to increase customer satisfaction & loyalty. Flipkart is also trying to develop its IT infrastructure, as online shopping is heavily dependent on technology. It wants to customize its IT framework to perform 2 functionalities. One is the ability to recommend its buyers to what other purchases can be bought to complement a product that has been already purchased from Flipkart (like recommending a stereo headset for a mobile phone). The other one is to simultaneously conduct a live survey by siphoning a small portion of this data to analyze customer purchase patterns & preferences. Flipkart is also considering having their own logistics so as to reduce dependability on the third party companies to provide it. Flipkart has also recently launched its own digital accessories brand Digiflip, & its apparel brand Flippd, & is yet to see how they perform in the market. Also part of its agenda is to be present in more number of cities, & for that it is contemplating on having larger no. of warehouses & increased automation in its supply chain system. Flipkart also wants to include more categories of products in its domain, & plug the gaps in its existing categories. As part of its expansion plan in India, Amazon has been pushing its Kindle tablet, especially the Kindle Fire range, which can automatically act as a catalyst for promoting its merchandise sales. As consumers are majorly shifting from computers to mobile handsets, they will be majorly benefited from reading e- books & streaming live music & videos through the Kindle devices. Amazon is mostly interested in its cash flow per share valuation rather than percentage margins. Thus, they are likely to offer even larger discounts to push sales. The company is also in talks with leading retail chains of India like Future Group, Spencer’s Retail, Woodlands, Shoppers Stop & Crosswords to act as a selling platform for their products. Amazon is also planning to introduce its very own mobile handset in the future, through which it hopes customers will have more access to its online store & its contents. But perhaps the most interesting & path-breaking service that Amazon is about to offer yet, is using drones, or unmanned aerial vehicles, to deliver packages to customers. Amazon came up with this concept in 2013, & will supposedly (according to media reports) be launching it first in India during in late 2014.The drone, known as Amazon’s Prime Air is an octocopter, i.e. fitted with 8 rotors, weighing less than 25 kg and travelling at over 80 kmph. The drone is supposed to be carrying a payload of up to 2.26 kg, which covers 86% of products sold on Amazon. Using this, Amazon believes, top-selling products like mobiles & books within 90 minutes to 3 hours for select customers.